Tom Newby was the first school in Benoni to introduce Marimba Bands into its extra mural activity programme. The school has 3 Marimba Bands that always achieve outstanding results at local and international level – Senior, Intermediate and Junior. Students who would like to participate in this activity will need to pass a music competency assessment. The Senior Band is required to perform for a London College of Music Exam in October of each year. An annual fee of R200.00 per child in the Senior Band is charged, to parents, for the administration of the LCM exam, entrance into the Eisteddfod and the International Marimba and Steelpan Festival. All other Marimba Bands are entered into the Benoni Eisteddfod and the cost of this entry will be charged to the parent – usually around R20.00 per item entered. There are three Marimba Bands that cater to children in Grade 3-7. This activity runs from January to November. For details regarding times and days of practices, please consult the extra mural schedule. There are three major competitive performances for the Senior Marimba Band: London College of Music Exam, The Benoni Eisteddfod and the International Marimba and Steelpan Festival. 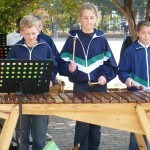 The most significant competitive performance for the Intermediate and Junior Marimba Bands is The Benoni Eisteddfod.